A quarter of Europe’s population lives in small and medium-sized towns and cities. Hiding away in these places is a wealth of untapped potential – including public buildings and land. In times of budget cuts, this public property can be used to steer urban development, with positive benefits for the city as a whole. 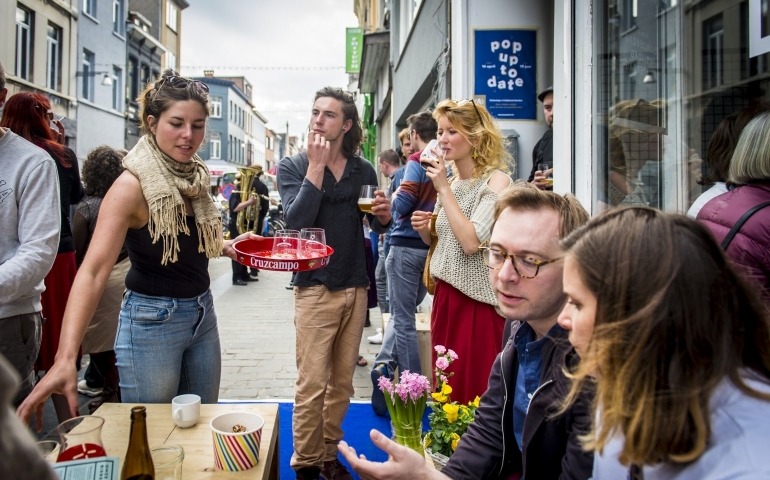 Drawing on experiences from cities across the EU – including URBACT Good Practice Cities and networks – here are 17 tips that will improve the use of public property in your city. Having a clear picture about the desired future of the city helps to guide decisions about public property. It is of crucial importance that this vision is co-designed, widely accepted, and shared among key stakeholders and citizens. The vision should also include strategic goals in relation to regeneration of old buildings. As soon as this vision is clear, start implementing these goals to promote the potentials of new use of public property in local communities. Although some changes cannot be anticipated, such as natural disasters, political or economic crises, many changes can be foreseen. Some key decisions answering the needs for public infrastructure, such as schools, kindergartens, or public housing, depend on demographic statistics, which can be projected in the long term. This is essential for any planning process and can support decision-making about the future use of public property. Public property management is often shared across various administrative levels, departments, and public companies. Keeping a reliable record of all public property in a city can be a far from easy task. Nevertheless, it is very important that these records are established, regularly updated, transparent, and publicly accessible. Open-source online GIS-based tools can be used to update property records through public participation. Using crowdsourcing methods, property can be categorized in terms of physical condition and potential uses. Several European cities have good experience with those tools. Here is a guide by the URBACT network REFILL to walk you through the relevant questions in establishing the right approach to mapping vacancy. Active civil society is every city’s true treasure. Nurture good relations with local people and groups as they have a great potential to improve and complement public services. Cultural institutions in particular can be valuable allies to municipalities. It is wise to support civil society organisations and active citizens both pragmatically and through long-term systemic cooperation. Free use of infrastructure and help with legal, bureaucratic, and formal challenges are as important as long-term cooperation. You can even try to open an NGO house, as they did in Riga, Latvia. When deciding about future use of unused public property, it can first be offered to vulnerable groups that need it most, like homeless people or migrants. This can include implementation of social programs that benefit vulnerable social groups. Especially temporary use of vacant spaces can help reduce exclusion. 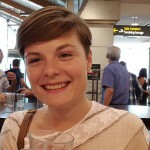 Find more about it in the REFILL network magazine and check out the good practices from Vilafranca del Penedes and Vaslui! Old buildings often offer exceptional architectural qualities that can be recognised as cultural heritage. Although this is sometimes considered as an obstacle for new investments, many user groups find value in heritage buildings and even bind their identity to the heritage background of the building. They will thus pay special attention to the maintenance of buildings and their surroundings. 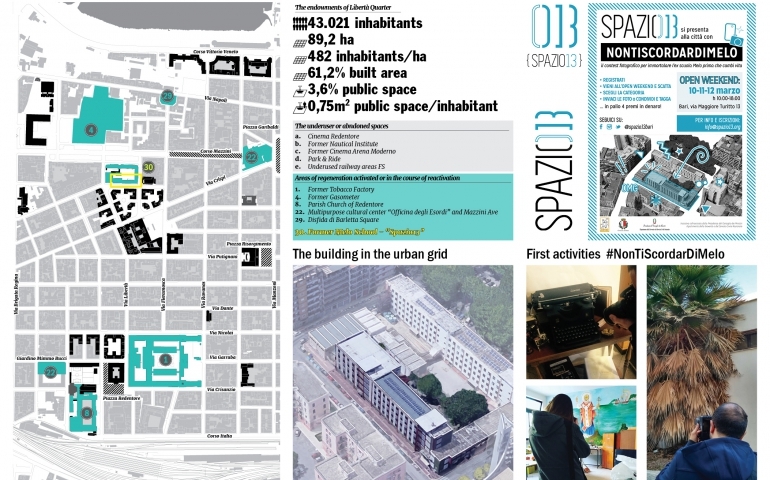 Exceptional buildings also offer opportunities for exceptional content and experiments, SPAZIO 13 – Creative Hub for urban regeneration in Bari being among them. Empty spaces are often a result of stalled investments, waiting for a more ambitious redevelopment. While waiting for the new purpose, they can be temporarily put into productive use. This is beneficial for users, property owners (as it reduces maintenance costs), and neighbourhoods, as users are the best keepers of the surrounding areas. Find out more about temporary use in this video by the REFILL network and check out some examples of temporary use in this URBACT blog post on collaborative spatial practices. In times of permanent austerity, buildings are often one of the few remaining resources municipalities in many cities across Europe still have at their disposal. Although it is tempting to sell unused property, it only brings limited short-term gains. In contrast to selling, making property available to local communities and civil society groups that complement public services brings lasting benefits. Empty buildings can be used to include citizens in cultural production, for community building programmes or to solve social issues. In Aarhus, they used empty property to address exclusion of vulnerable young people and youth unemployment. Empty buildings can also present an asset in terms of stimulating typical urban economic sectors, such as creative or tech industries. Cities can supply newly established companies with an affordable production space. Particularly entrepreneurs dealing with creativity, arts and culture don’t mind using older, even temporarily vacant buildings, especially if they can refurbish them themselves in order to adjust them to their own needs and taste. Municipality serves its citizens; therefore, they should be directly involved in decisions about public property use. Develop consultation procedures on desired use of empty property, in particular in relation to larger empty complexes. Including citizens in decision-making processes also builds upon their responsibility for the common good and encourages people to get involved in revitalising and maintaining public property. Some URBACT Good Practices of stakeholder involvement in the revitalisation of vacant buildings and sites have been developed and tested by 2nd Chance network partners. Citizen power can also be a solution when financial capital for regeneration of empty buildings is limited. It is not unusual that regeneration is grounded on the social capital and voluntary labour of citizens who approach the regeneration process in a bottom-up manner. Temporary use of public property has multiple benefits, but in smaller or declining towns and cities there is often not much demand for temporary use. Promote vacant property accordingly, actively search for potential users, and acknowledge the role of independent local actors and self-organised initiatives. You can also test temporary use of vacant shops for very short periods, such as one day or one week. A good way to get feedback from the citizens is to combine the testing period with some other event or festival. When demand for empty spaces is ample, establish clear criteria and transparent procedures for the selection of users. The city’s long-term goals and vision should guide the criteria more than short-term economic gains. Citizens and various user groups can also be involved in the formulation of the criteria. Giving priority to user groups acting in the public interest can be one of the criteria. Larger complexes often present a particular challenge for local communities when looking for renovation funding, for potential buyers, but also when searching for users. Thus it is a good idea to put a complex back into use step by step. It keeps things manageable and leaves some work to the snowball effect, as most probably one use will attract others and the complex will fill up gradually. In large complexes, it is important to ensure diversity of users and uses, particularly when long-term and temporary uses are combined. Culture can be a good device to identify and define new uses for large empty complexes – as witnessed by cities in the 2nd Chance network. When demand from user groups acting in the public interest, exceeds the extent of spaces the municipality can offer, take on the role of an intermediary and broker between private owners of empty property and potential users. As a public entity you can bridge any lack of trust, which often prevents private owners from leasing their property to civil society groups. The role of the intermediary can be delegated to another organisation, such as an NGO, who can operate more flexibly and with less formal restraints. Find more information on how to broker between stakeholders for temporary use in this REFILL magazine; and discover an example of good practice in Antwerp. When several user groups and organisations share a building, it is very important that they establish good working relations and even synergies. This can greatly reduce the hassle of public owners with maintenance issues, so it makes good sense to support networking among the tenants. In large complexes a common platform connecting users can be established to ease maintenance and assign responsibilities. This platform can also be formalised in a representative body to take care of the management and provide a link between the owner and the users. 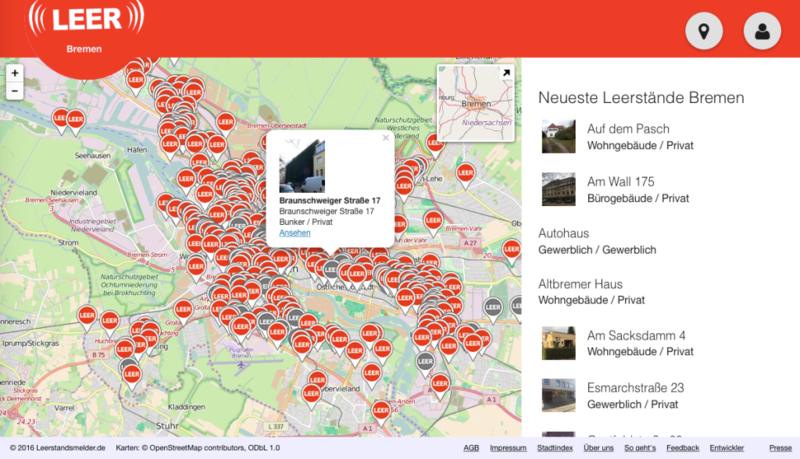 Check out the URBACT Good Practice in Chemnitz (DE) on revitalising decaying historic apartment buildings by connecting owners, investors, users and public authorities. NGOs and other civil society organisations can often be the source of social innovations. These can directly contribute to renovation and revitalisation of public property and thus raise its economic as well as social value, while also enriching local communities. Support them and involve them in municipal renovation projects. Check out the 10 steps towards social innovation in cities on page 55 in this URBACT booklet or surf the BoostInno website for more ideas on how to stimulate, foster and develop social innovation. When dealing with scarce financial resources, try to experiment and encourage civil society organisations to develop innovative approaches and new models of public property management. Strive to develop relationships with users that incorporate an appropriate level of flexibility to enable innovation in management models. Glasgow (UK), for example, is fostering sustainable cooperatives and social enterprises – another approach to receive the URBACT Good Practice label. Some attempts to regenerate empty spaces might fail. Reasons might be beyond your control. Do not let an occasional fail stop you from testing new types of cooperation and management. In many cities, large empty complexes are not owned by the municipality but by the national or regional public authorities. This can make communication between the owner and the users very difficult. In these cases, the municipality can take over the broker role, making management and maintenance of the property feasible. Like these hacks? Commit to actively implementing the NIFOB Guidelines and promote the idea of public property as a tool to steer urban development to other small and medium-sized towns. More info here. Search the URBACT Good Practice database for additional cases, and follow the REFILL and 2nd Chance networks for new solutions. These guidelines on better use of vacant public property have been developed by NIFOB – New Ideas For Old Buildings, a project focused on improving public property management to help municipalities increase the real estate occupancy by public participation.